Children are much more likely to die in a car crash in Mississippi than in Massachusetts. That's among the findings of a new study that found wide variations in child traffic deaths from one state to another. 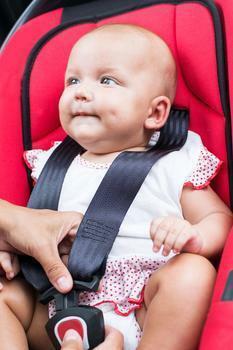 The use of child restraints, like safety seats and seat belts, and the prevalance of red-light cameras appear to be among the factors influencing the wide variations, according to an abstract being presented at a pediatrics conference. Researchers examined 2010-2014 National Highway Traffic Safety Administration data and discovered substantial differences among states, with annual mortality rates ranging from 0.25 deaths per 100,000 children in Massachusetts to 3.20 deaths per 100,000 children in Mississippi. In general, states with a greater percentage of children who ride unrestrained or inappropriately restrained, and states where a larger proportion of crashes occur on rural roads or during the daytime, had higher motor vehicle crash death rates. States without a red-light camera policy also had a greater percentage of children dying from crashes. Abstract author Lindsey L. Wolf, MD, a third-year resident and research fellow at the Center for Surgery and Public Health at Brigham and Women's Hospital and her colleagues determined that a 10 percent absolute improvement in child restraint use nationally could prevent more than 1,500 children from dying over five years. Many previous studies have looked at an individual's risk factor for dying in a motor vehicle crash, Dr. Wolf said, but stepping back to view these risks at the regional level shows how many lives might be saved by developing and enforcing state child safety regulations. "We are interested in helping states understand how their laws can prevent children from dying if they are involved in a car crash," said senior author Faisal G. Qureshi, MD, FAAP, Associate Professor at the University of Texas Southwestern Medical Center. "Once lawmakers understand this at a state level they can make more informed decisions on what laws to focus on." The abstract, "Pediatric Deaths from Motor Vehicle Crashes: State?level Variation and Predictors of Mortality," will be presented Oct. 23 an American Academy of Pediatrics conference in San Francisco.